On Dec. 14, 2014, orienteering enthusiasts from Northern California and beyond will descend upon the west shores of Folsom Lake to partake in Gold Country Orienteers' first event using a new, expanded and completely redone map of this popular recreation area. Most of us don't give these maps much more than a second thought, but they are in fact quite substantial undertakings, and the men and women who make orienteering maps are very much the unsung heroes of our sport. Well, unsung no more, as in this article we will try to provide you with a glimpse into the lives of Bill and Heidi Cusworth, who made this new map possible, and the specifics of a map-making project like Granite Bay. Making a map involves many steps. It starts with satellite photos and elevation data (Lidar). Lidar data is collected by low-flying airplanes equipped with special laser equipment that can produce elevation data with two-foot accuracy, and the data exists for large areas surrounding population centers. Using this data, most of the topo lines for a map can be generated. This process is not trivial, but involves the use of several programs, as well as time-consuming manual line-matching, before the contour lines end up on the actual map. Aside from this, satellite photography analysis and hundreds of hours of painstaking field-checking are required to produce a map ready for serious orienteering competition. In June 2014, Bill and Heidi began work on the new map of Granite Bay for Gold Country Orienteers. The Cusworths feel that the Granite Bay map is the most accurate map that they have made, owing to the quality of the base data (excellent contours from a Lidar survey in 2012 and aerial photos from 2013) and experience from past mapping projects. It should be a real treat for those venturing to Granite Bay on Dec. 14. Bill and Heidi not only made the map—they are also setting the courses. Enjoy! Bill was born in upstate New York and did orienteering with the Boy Scouts growing up. He moved to Seattle WA for grad school in 1990, began the sport of orienteering in 1992 and started working on maps for Cascade Orienteering Club the following year. He worked on updating many local park maps through the '90s. He founded the Husky Orienteering and Running Club in 1992 and event-directed many events for the club, and was on the team that won two U.S. Intercollegiate Championships. He was a member of the Orienteering USA board of directors from 1997-2003 and was the national rankings coordinator from 1993-2002. Heidi grew up in Sebastopol, then attended UC Santa Cruz, before moving to Washington to work as a travel agent. She learned about orienteering first in 1995, when at work she sold Bill three plane tickets, all to different areas in the U.S. for A-meets. It sounded fun, but she didn't try it until 2001, when the two met again. She attended her first meet with him as one of their first dates. She says it not only was fun but changed her life. They married two years later. They started competing together in orienteering and rogaining events, but did not do mapping until 2008, when they started making orienteering maps together on Whidbey Island, where they were living. Over the next four years, they made four maps on the island and one on the mainland north of Seattle. Three of those maps were used in Spring 2012 for the U.S. Interscholastic Orienteering Championships. They moved to Santa Rosa CA in 2011. They made a new sprint map at the Land's End area in northwest San Francisco and updated a portion of the the Annadel State Park map in Santa Rosa. 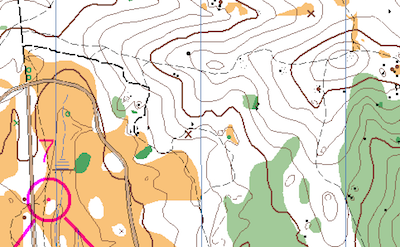 They also updated the Boggs Mountain map in Lake County and courseset two A-meets there.